I love wearing maxi dresses in the summer. They are hands down one of the most effortless ways to look fashionable and chic during those hot summer months. This particular maxi dress is insanely comfortable and flows beautifully as you walk. You always hear that vertical stripes make you look taller. Diagonal stripes would have the same effect. I came up with 6 different ways to wear this strapless maxi dress but the versatility is endless. Which one is your favorite? Linking up with Manic Monday today! I love throwing my denim jacket over a maxi! I'll have to try the knotted t-shirt next! I love anything with chambray but also love the ampersand t shirt! I am genuinely impressed that you came up with SIX ways to wear this. I probably wouldn't have thought of anything beyond the jacket over it and just by itself with a necklace. Naturally, those are my favorite options but the knotted chambray and ampersand tee are really cute too! 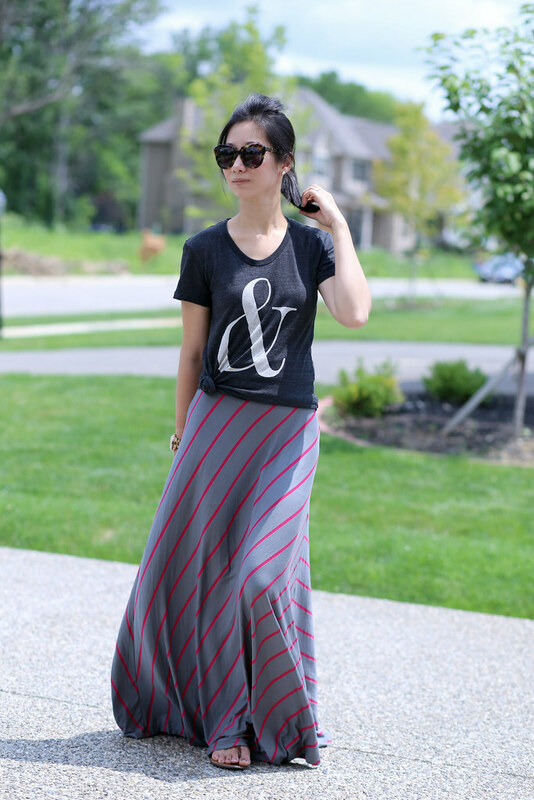 Thanks for sharing how versatile a maxi dress is.